I love to tell that story, of Jesus and His love … and so do you! Sometimes God tells the story in miraculous ways by revealing Himself to Arab people. A Moroccan man was living in a refugee camp in Europe. He attended a JESUS film showing of a ministry partner, Elijah 21. This group invites people living in the camps to local churches and busses them in. Upon arrival, they receive a hot meal, aid, and are invited to watch a film about Jesus, the “Great Prophet Isa.” Remarkably, almost everyone stays to watch, curious to learn more about the love they have just received. Many respond to the gospel. That Moroccan man watched and believed. And he was excited. He told the team worker something that was simply amazing. Speaking with fervor, he said: “Years ago, when I was walking on a street in Italy, I found a VHS tape. It was this film, JESUS. I took the cassette home and placed it in my tape-player and began to watch. But I became very uncomfortable. After 30 minutes, I pressed stop and took the tape out. “But the film continued to play—even though I had removed the cassette! I got really, really scared. The only way I could get it to stop was to turn off the TV. I’ve never forgotten. The ministry worker who wrote of that showing said: “This outreach will resonate in our hearts forever! Jesus’ presence was so powerful. 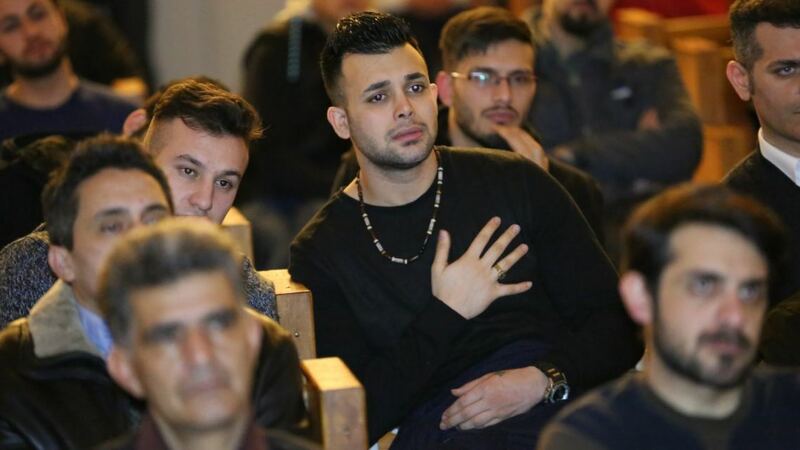 Refugees cried, clapped their hands and cheered—and all of this in one night! What a Jesus! What a deliverer and what a wonderful Savior! He broke the yoke [of slavery] for so many that night. Jesus freed them and gave them joy that no one can steal. All the praise and glory go to our Lord. Now, may I tell you about Indira, a woman from a different background. * She was born a Hindu and had experienced a very different story about Christianity, one that was horribly distorted. Sadly, Indira’s husband died. He left her and their two sons, five and 10 years old, in total poverty. A woman who identified herself as a Christian came to Indira’s village, learned of her difficult situation, and offered: “I will take your boys to a city, out of poverty, and get them scholarships so they can have a good education.” Without any way to support her boys, Indira agreed. The so-called “Christian” woman then disappeared with her sons. After considerable searching and going to the police, Indira discovered that the woman was in a child-trafficking ring and had sold the boys into child labor. With the help of the authorities, she got her sons back! But now Indira was bitter and decided she would have nothing to do with Jesus or His followers ever again. Four years passed. A film team came near to her home to show JESUS. Indira refused to attend because it was Christian. But she could still hear the soundtrack in the distance, and the words of Jesus in her mother tongue: “Blessed are the poor in spirit for theirs is the kingdom of heaven. Blessed are those who mourn, for they will be comforted.” Indira was overwhelmed. She walked to the showing and began to watch. At the resurrection, it all made sense. She believed. Indira obtained a DVD of JESUS and started showing the film in her home. She led six women to Christ and started her own home fellowship. She is now training them to tell others the story of Jesus! Lastly, this story is from Africa. Adam was a taxi driver. He served six months in prison for an accident in which one of his passengers was killed. Adam said the prison conditions were terrible. While there, however, he was given a booklet about Jesus: “I didn’t really understand since my family and I were from [a radical religious group]. Upon my release from prison, I searched for Christ-followers to learn more about what I had read. I needed to understand. I found some people who were showing the film JESUS in my neighborhood. What wonderful transformations! It’s an honor to share these reports with you. Thank you for your partnership that helps make them possible. I write because I want you to be a storyteller, too. There are several ways you can by sending equipment so unreached people can experience the glorious gospel in their heart language. For there are so many more Indiras, Adams, Imams and refugees that need to know of God’s love and forgiveness. Chances are they’ve never heard the good news, even once. You can give them that chance, as God may lead and enable your partnership. I especially call your attention to an extraordinary opportunity: to supply 200 workers in West Africa with 200 video tablets. They need this equipment because they are seeing an unprecedented openness to the gospel. Many more can be set free using these powerful, versatile tools of evangelism and discipleship. May I also draw your attention to the Church-Planting Resource Kits? These are in very great demand and extremely useful. They enable a worker to take JESUS as well as other films virtually anywhere, reaching up to 200 people at a time. Each kit can be provided for a gift of $3,240. That amount is not possible for the majority of us. I understand. But many friends of JESUS can work together and collectively provide a kit through gifts of $40, $160, $325, $650 or more—each of us doing what we can. Please also consider providing a bright, 300-viewer “Gather-Them-to-Jesus” video projector set for a gift of $1,905, or a 10-inch tablet set with extension speakers for eight viewers. These are like iPads and will tell the story of the gospel to small groups and families. You can provide one of these sets for $570. You can also supply a smaller video tablet for $285. Another option is to equip workers with a solar panel and screen set for a gift of $950. Or, if you have the ability, you can send a Large Video Projector Set for $7,620 and reach large audiences (up to 3,000 people). And please remember, we can all have a part by giving a portion. Every gift will make a difference, large or small, as He leads and enables. One last story! Prasuram is a 54-year-old man. He came to an outside showing of JESUS. But as the film played, suddenly it began to rain … hard! Everyone left for their homes except Prasuram. He actually pulled out an umbrella, raised it over his head, and sat on the ground watching the whole JESUS film—he was the only person who remained. As you review the information sheet, please read about the refocused direction taking root in Jesus Film Project® and the just-received new opportunity in a closed Asian nation. Thousands of pieces of equipment are going to be needed to finish the task of fulfilling the Great Commission. I extend to you all our thanks for your partnership, for joining in this God-sized task and vision—for obeying the Great Commission. God bless you for however you can help. PS. Opportunities abound for film teams and partners who are ready to show the world JESUS, especially in West Africa and in Asia. Remember that every gift will help and make a difference, large or small. Please mail your gift, or give online, securely and safely, at www.jesusfilm.org/equipment. Or you can help through a credit/debit card gift when you call (800) 387-4040. If possible, please send or post your generous gift by May 31, 2019. For tax-wise gifts, including IRA retirement gifts and appreciated stock or property, call (888) 278-7233 or email stock@jesusfilm.org. Thank you.